To try it, make sure you use Google Chrome and Gmail's rich text mode. Compose a new message, open your favorite file manager, find a photo and drag it to the Gmail message. For some reason, I was only able to drag one photo at a time. After inserting the image, you can resize it and adjust its position. Gmail has a Labs feature for inserting images, which works in all browsers, but it's less convenient. I like this feature (I already use it in Gmail Labs), but I don't like there's no Move option. The only way, that I know of, to move an inserted image is to place the blinking cursor line on the left of the image and then hit Enter to move it down and Space to move it sideways. the gap between desktop mail client and web mail client is certainly narrowing. Small, yet awesome piece of work! That's great! But attaching docs from Google Docs or pictures from Picasa while composing an e-mail is still impossible! This feature would be extremely useful if available in Google Docs. Moving pictures from my computer directly to a particular folder in docs would be awesome. Do you know if this will eventually become available? Every time you heave a sigh of relief and get ready to bet that emailing can't get any easier, Gmail surprises you with another awesome feature like this one. Gmail by far is the best free email service provider. Can somebody explain in lamens terms how I use this? I can't figure it out. What "file manager" do I use and how? Can I use Picasa? The default file manager in Windows is Windows Explorer, but that doesn't mean you can't use a different software. My favorite file manager is Total Commander. Thanks. As for now this looks pretty useless to me compared to the labs feature because I have to open another program and it doesn't support Picasa. Thanks anyway though :). "Is this the first Gmail feature that only works in Google's browser?" I used to be able to drag and drop pictures from the web in firefox, quick and easy. Unfortunately, since the introduction of drag and drop attachments this is no longer possible. I agree with what alskor said! The drag n drop works, but how does one resize an image? Click on the image and you'll get three options for resizing the image: small, medium, large. Hi Alex, that was the first think I tried. However, no option for resize came up. I tried right and left click, and center click. The small medium large only appears if you have the Google Labs "Inserting Picture" installed. When I want to D&D a picture into the body of an email, I use the Mozilla Thunderbird email client. It allows one to D&D or Copy jpg, gif, and png files, or to D&D graphics (such as political cartoons, graphs, etc). Better yet, Thunderbird will take bmp files/graphics (from the Clipboard, PrtScr captures, etc) and automatically convert them to a compressed jpg format. Before that, it was possible to open a web page everywhere site, and drop an image of it into a new composed google mail. It doesn't work when 'Offline' is enabled. Me too, doesn't work for insert an images to message. It shows failed! and to try again. Not only images you can also add files by clicking and dragging. It is really a great function by them. 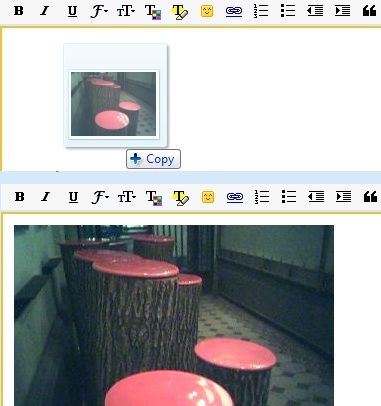 I have tried everything to cut and paste photos into a gmail. I use rich text, and labs, but no resize (as the other gentleman above noted) comes up. I know others have this feature. I click on "insert image" and the window comes up; I browse and find a photo, and it just keeps chugging and chugging and finally loads...but no resize. It takes way too long. I used to be able to just cut from my pictures folder and paste into an email document. What happen and how can I rectify this. I cannot send photos any longer and I did it so often. Friends/family disappointed as I am the photographer always! So, this is my problem. I used to get the e-mails with the images shown in the text box. Now -- for picasa photos only -- all I get is the icons, and I have to click on each one to see it. Which I'm not willing to do unless it is critical to view them. I've checked all my settings, and security settings aren't the problem.